Recent seasons have seen quite a turnaround for Göteborg FC. 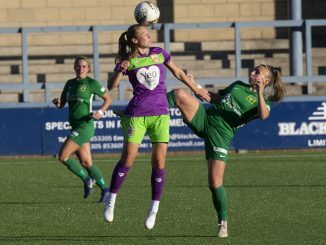 In 2017 they escaped relegation from the Swedish top tier Damallsvenskan and then a year later the club finished second and qualified for the UEFA Women’s Champions League in 2019/20. One of a few players added to the roster last year was Finnish international Emma Koivisto who started 21 of 22 league games and contributed to the team’s tremendous upturn in form, including beating former champions FC Rosengård 4-2 in the very last game of the season to surpass them and claim second position. Rainer Fussgänger of DamFotballBlog caught up with the 24-year-old right-back. SAPA stands for Savannan Pallo, ’Savanna’s Football’, Savanna being a restaurant where some young football enthusiasts used to gather in the late 1960’s. They founded SAPA and since they thought it wouldn’t sound too good connecting a football club to a restaurant, they only used the abbreviation when talking about the club. The next stage in Emma’s career was joining HJK Helsinki when her father found out that they had girls’ teams. HJK are more or less the biggest club in the nation and are conveniently based not far away from where the Koivisto family lived. She went to a try-out and was welcomed gladly. Soon Emma started playing for the Finnish girl’s U17 national team, despite being only 15 years of age at the time. As often happens for Finnish players who have the talent and want to progress to a higher level in their game, Emma had to leave. From the capital of Finland she moved to the capital of Florida, Tallahassee and the Sunshine State became Koivisto’s home for the next three and a half years. Had that been a dream of hers to play college soccer and how did she get there? “I am a person who really doesn’t have any dreams,” she laughs. Leaving her family and her home and moving 8200 km away is not easy for a young adult, says Emma. In her freshman year, the Florida Seminoles won the NCCA-championship for the very first time. And Koivisto played 23 games with the team. “I was surprised that I even got to play there since I didn’t know much about college soccer,” she says. Koivisto praises the facilities that the team uses at Florida State, in fact she believes that very few professional teams in Europe have the same opportunities for their players. In 2016 and 2017 Emma Koivisto played together with young Venezuelan talent Deyna Castellanos. How is she like as a player? Emma Koivisto has now moved back to Europe and Gothenburg to turn pro and apparently, it was former Finnish team mate Adelina Engman (now Chelsea Women) recommended Emma to the club that goes under the abbreviation KGFC. Exactly like her move to Florida, Emma didn’t have high expectations in terms of playing time for the start, but once again she went into the starting XI of her new team. Last weekend, in a Swedish cup game that KGFC won by 13-0 against local rivals Jitex, who play in the third tier, the right-back scored a hat-trick. When was the last time you did that before last week? As always by the end of February, it’s time for the national teams to meet up again. Finland will again travel to Cyprus and play South Africa, Czech Republic and North Korea in their group, quite diverse opponents who all have a very different style of football. 2013 was the last time Finland participated in the UEFA Women’s EUROs. It seems that a lot of other countries have surpassed the Finns and that qualifying gets more and more difficult for the current generation of ‘Helmarit’ (‘The Helmets’) as the team is called at home. Finland have been drawn in a qualifying group with Scotland, Portugal, Albania and Cyprus. What does she think it will take for them to step up again and make it to the EUROs in England 2021? “That’s a really good question and honestly, I don’t really have an answer for that,” says Emma Koivisto. 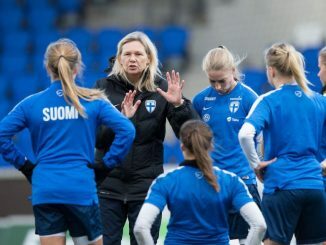 Fitness coach Anne Mäkinen, a former international and named best player of EURO 2005 in England, has given each and every member of the national time an individual plan to work on. Both Mäkinen and the Swedish team manager of Finland [former Scotland Head Coach], Anna Signeul, do a lot of scouting and try to see their players as often as possible. 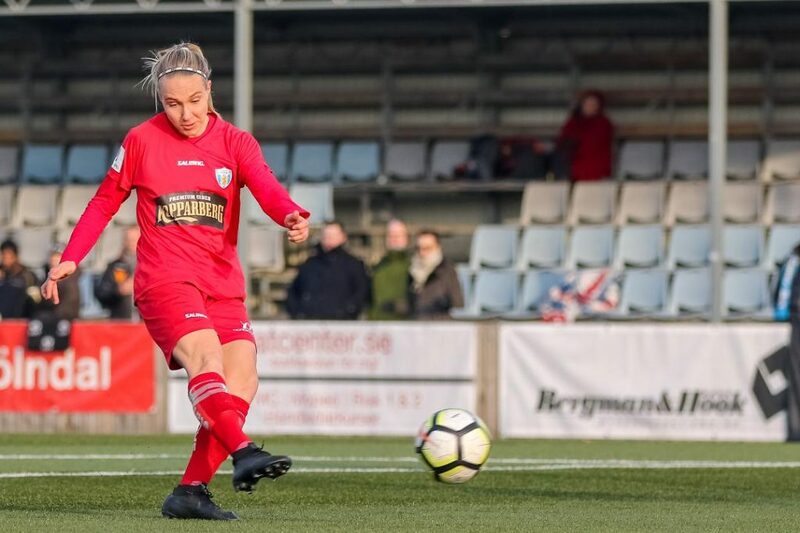 Having started her career in SAPA, Koivisto has now arrived in the very elite of Swedish football and as ambitious as she is, she might be a part of further success. Her contract is for both this season and next at KGFC.